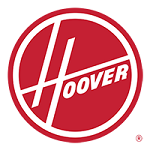 Hoover is one of those companies that has been around for a long time. As a matter of fact, in 1908 they were the first company to produce a portable electric upright model with a vertical motor. This was quite an impressive machine in its’ day to say the least. Back then there weren’t any other vacuum companies who were focused on building products for home cleaning, but Hoover saw a need that no others did. Today their current lineup is full of upright, canister, lightweight, handheld, and even robot vacuums for removing dirt from any surface you can think of. They even have several steam and carpet cleaners for deep shampooing those tough stains out. The key to getting the most out of your new Hoover actually begins before you buy it. You see, with such a large choice of capable cleaning machines you need to make a list of the jobs you will want to do with it first. Once you have this list compiled you can compare it to the specs of each lineup to decide on which one (or potentially ones) will work best. One feature you will want is a HEPA filter. These filters help remove harmful microscopic allergens from your carpet so you don’t end up breathing them in. And not only do you want HEPA filtration but you want a system that is rated to remove more than 99% of the smallest allergens like dust mites and pet dander. Their Windtunnel™ vacuums are always among the best in the industry at filtering the air so it is clean and healthy before it passes back into your home. Hoover has always been known for innovation and being the first to market certain features. One great example of this came in 1926 when they introduced the first known beater bar. This was the first introduction to this on a vacuum cleaner and people quickly saw the advantages to the design. They marketed it as “it beats, as it sweeps, as it cleans”. The combination of this metal (at the time) bar loosening the dirt from down in the carpet fibers and strong suction, combined with a spinning brush bar completely revolutionized the cleaning industry. Over time the beater has changed quite a bit, seeing many improvements in design and performance. And while it lead the way in their innovations, it wasn’t the last. They have also pioneered the vacuum headlight, disposable paper dirt collection bags, side mounted hoses, and even the self propelled capability that changed how we thought about full sized heavy cleaners. They took what was once a difficult task for some people (pushing a heavier upright around) and made it much more manageable. The Hoover Windtunnel Max Pet Plus is a full sized, bagless cleaner that has many features necessary for those households with pets. Removing pet hair and dander are the biggest challenges, especially when multiple animals are living in the same environment. The Pet Turbo tool has small spinning brushes that can pick up even the most stubborn hair from many surfaces like furniture, stairs, and bedding. It also comes with their Pet Static tool for a more gentle approach. This attachment uses static attraction and suction to pull up hair from clothing and delicate blankets. 12 internal cyclones separate the dirt from the air inside the machine. This all happens before the air even reaches the water rinsable filter, resulting in fewer cleanings. And even though you are rinsing the filters less often you aren’t experiencing any loss of suction during use. This is part of what their Windtunnel™ lineup is really known for. Other highlights include a wide 15 inch cleaning path and an activated carbon HEPA filter that is rated to remove 99.97% of microscopic organisms down to the size of 0.3 microns. This is especially important for those families who have allergies or asthma to deal with. Keeping the air clean inside the home is a huge part of overcoming allergic reactions to dust and other filth. You will breathe easier and feel better when you are living in a cleaner environment. Click here for our review and to get more detailed specifications, to help decide if it’s the right choice for your family. 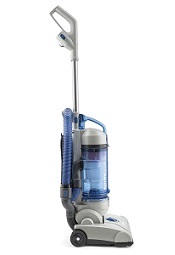 Hoover calls their Windtunnel 3 Pet their best cleaning full sized bagless upright. It has their latest generation Windtunnel™ technology with 3 air channels and 13 internal cyclones. The result is almost no loss of power due to clogging, and a steady suction power throughout the entire vacuuming session. 3 attachments come included to help clean a variety of surfaces. The pet turbo tool has a spinning brush to work any embedded hair or dander out of carpeting and upholstery. This is a must for any home with animals that shed as the hairs will gather on just about everything in sight. 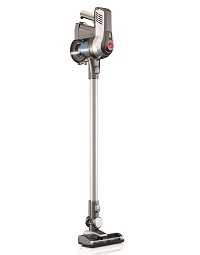 The pivoting dusting tool is unique in that it turns in a 90 degree angle to reach places that other vacuums cannot. And the crevice tool is useful for corners and between sofa cushions, and is very similar to comes on most uprights sold today. You also get the same activated carbon HEPA filter found on their other models which not only removes tiny allergens from the air but also helps cut down on odors. This is important in households with multiple pets as the smells can overpower visitors if not held in check. To learn more about it and check current pricing, click here for our detailed review and feature rundown. The Hoover Windtunnel Air is a very lightweight and highly maneuverable canister vacuum that comes with a variety of attachments. You can handle just about any surface and even turn the spinning brushes off with the push of a button. The power head does a good job on most carpets but it will struggle a bit on the thicker ones. Just something to consider should you have them installed throughout your home. The ‘Air’ also comes with HEPA filtration for removing those tiny organisms that you cannot see. Without this they would just pass right through the machine and back into the room, waiting to come into contact with any family member who walks by. 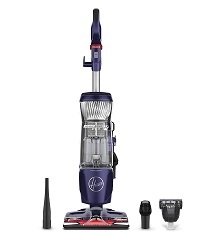 Combine this with the Windtunnel technology that Hoover is known for and you get a lot of value for the relatively low purchase price. In addition to this you also get simple steering, multi-cyclonic suction, and an auto rewind cord for compact storage. 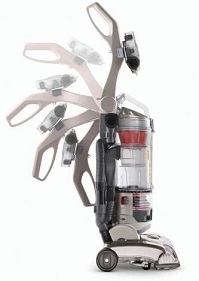 It’s a solid if not spectacular vacuum from a company known for packing a lot of features into each of their vacuums. Click here to read our full review to learn more about the pros and cons of this model. 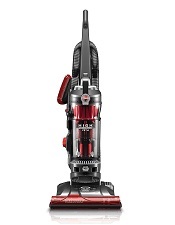 The Hoover Cruise is their lightest vacuum, weighing in at just under 5 pounds. 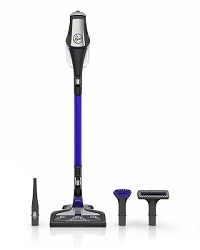 It is cordless and comes with the latest generation 22 volt lithium ion battery. These batteries last much longer than the ones found on prior cordless vacuums and they provide fade-free performance. This means the power will stay almost constant up until it is drained. It also has their unique “Steerable” design which lets you glide it around the many objects in your home with the flick of your wrist. When you combine this feature with the ultra low weight of the machine you get a very easy to use vacuum, one that takes little effort on your part. Sure it doesn’t have the power of larger upright models but it wasn’t built for that. It is a multi purpose model that works on smooth floors as well as low piled carpets. Other features include a washable filter, wall mountable charger, and a one button empty system that keeps the dust particles away from your skin. You get a lot of value for a relatively low price. Read our review here to see if it would be a good addition to your home cleaning stable. If you have a smaller house or apartment, then the Hoover Sprint QuickVac is just the right size for you. It is compact, lightweight, and affordable which is a nice change from the high price that some of the other brands boast. But even though it is a compact machine that doesn’t mean it has no power. Multi cyclonic filtration and a powerful motor work together to separate the dirt particles from the air before it makes contact with the washable HEPA filter. This saves on washing which will prolong the life of the filter, ultimately saving you money. Plus it helps keep performance higher as a clogged filter is one of the main reasons that bagless vacuums lose their suction power. It doesn’t have the cleaning performance of their full sized Windtunnel but it wasn’t designed for that. It fills a niche that is lacking in other capable cleaners, since most of the competitors are sorely lacking in ability. For more information about the QuickVac including purchasing recommendations, click here to read our review. The newly designed Fusion Pet Cordless is another one of their lightweight models that has a surprising amount of technology built in. This includes a dashboard display with the pertinent operating information, a fast charging lithium ion battery, and Windtunnel technology for more power and less clogging. You can also operate the Fusion as a handheld mode for when you need fast and portable cleaning. Use it in your car, the basement, the garage, or anywhere you need to contain a quick spill. All the attachments work in handheld or with the extension wand attached. 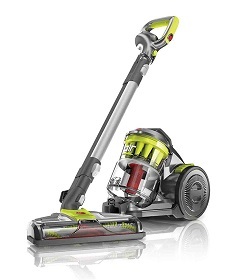 Nothing in your home will be out of the reach of this capable lightweight vacuum cleaner. An included pet hair tool is just right for removing stubborn hair from all surfaces around your home as well. And the filter is designed to cut down on animal odors as the air passes back into your home. Click here for our review for a rundown of all the features and information on where to find the lowest price. The purpose built PowerDrive Pet is a full sized upright vacuum that is designed for homes with multiple pets. It is bagless so you won’t be forced to purchase pricey replacement bags yet it is engineered to not clog at all during use. Their Windtunnel technology spins the air through with such force that it just cannot settle inside. It comes with multiple tools for cleaning up pet hair and dander, and the fully sealed filtration system keeps any microscopic allergens safely inside. It is rated to remove virtually all dust mites down to 0.5 microns in size…which is very small! This is especially important for those with allergies or asthma as it will keep the indoor air quality high, as long as you use it often. This full sized machine is priced like an entry level offering but don’t be fooled by that. It possesses quite a bit of cleaning power and enough features to facilitate cleaning the average household. For more information, click here to read our review and overall recommendation.